The compact Ecreso FM transmitter range includes a direct to channel digital modulator into its 3U chassis and offers a wide range of on-board features in addition to its core structure of digital modulator, 6th generation MOSFET and up to 76% efficiency. These include a dynamic RDS encoder, stereo encoder, 5-band sound processor, MPX over AES, and GPIO support as well as Single Frequency Networking. With the launch of the Ecreso FM 3kW Transmitter, the power range of the compact system is extended to now reach from 100W up to 3kW. 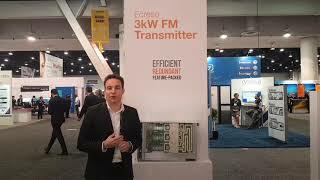 However, the new Ecreso 3kW FM does not only add additional power but also built-in redundancy on the system’s power supplies, power amplifiers and fans as well as hot-swappable power supplies. Several configurations available (redundancy, cooling, mains...) : contact us !